The County Board is poised to pass a controversial incentive package for Amazon this Saturday, which could help bring tens of thousands of jobs and millions in added property taxes to Arlington County, at the cost of tens of millions in tax subsidies for one of the world’s largest companies. The Board is scheduled to vote on the multi-million dollar incentive package during their regularly-scheduled Saturday meeting, which is Amazon’s last hurdle to clear before beginning development on their new headquarters slated to start construction in 2021. The meeting begins at 8:30 a.m. at the Bozman Government Center in Courthouse, however, the Amazon part of discussion isn’t scheduled to start until after 1 p.m., per an agenda summary and the hearing is expected to be dogged with public protest from critics opposing Amazon. The county’s incentive package was first publicly released earlier this month and features a 15-year, estimated $23 million incentive given to Amazon if the tech-and-retail giant meets office space occupancy goals over several years. The company would need to fill 60,000 square feet of office space starting in June of 2020 and meet benchmarks towards occupying 6 million square feet by 2035. The incentive is funded from a portion of the increases in hotel tax revenue that officials predict from Amazon’s “HQ2” moving to the region. The incentive package up for a vote Saturday also includes plans to spend $28 million over a period of 10 years to update infrastructure around the proposed headquarters, in addition to the state’s multi-million-dollar contribution. 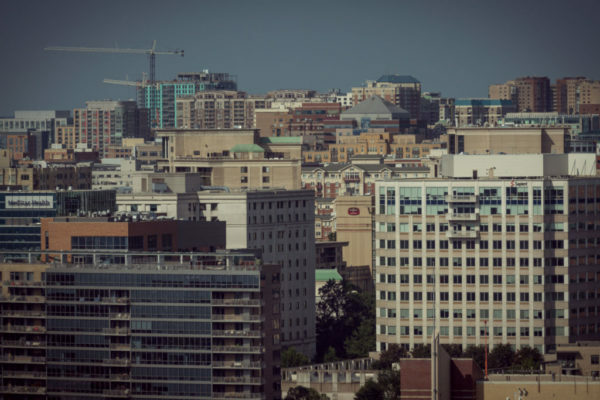 That money will be pulled from a portion of the increase in commercial property tax revenue in the Crystal City area that results from Amazon’s arrival. 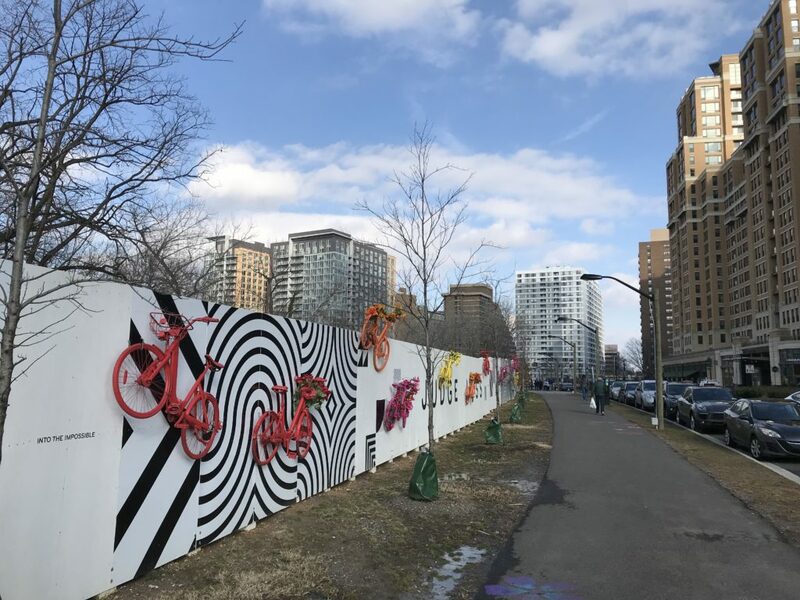 The county also offered to at least try to fulfill Amazon’s request for an on-site helicopter pad on-site despite residents’ ongoing complaints of existing helicopter noise and the region’s strictly-enforced no-fly zone. Amazon announced it selected Arlington as the site for its second headquarters in November, promising to bring at least 25,000 jobs and occupy 6,056,000 million square feet of commercial space in the Crystal City and Pentagon City areas, which have experienced high vacancy rates for the last 15 years. County Board Chair Christian Dorsey said in February the expected number of Amazon jobs is now higher because the company cancelled its other headquarter plans in New York City. The incentives have drawn persistent criticism from activists who believe the county shouldn’t be giving any incentives to a company run by the world’s richest man — and who fear its relocation to Arlington will exacerbate the county’s affordable hosing shortage. Critics have also raised red flags about a portion of the agreement that gives Amazon advance notice of FOIA requests. On Friday, local activist coalition “For Us, Not Amazon” announced a noon protest outside the county government steps on Saturday before the vote. “While the County tries to ignore us, For Us, Not Amazon has been doing the real community engagement, knocking doors, listening to community members’ concerns and it’s time to make sure Arlington County officials listen to every one of us before this sham gets voted on,” the description of the rally reads. For Us, Not Amazon’s member organizations knocked on doors earlier this week to gather petition signatures opposing the incentive package. Thank you everyone from today's canvass in the Nauck community, a historically black neighborhood that was not included on the list of civic associations that the Arlington board has reached out to. The Board originally planned for a February public hearing and vote on the incentives but rescheduled to March, citing the need for more community discussions. Saturday’s vote does not include the state’s $750 million-incentive package to Amazon, which the Virginia General Assembly overwhelmingly approved in January. This weekend’s Board meeting will also not include ideas county officials pitched Amazon but didn’t officially include in the incentive package — such as suggesting Amazon take advantage of a little-used technology incentive program to potentially save millions in taxes, as first reported by ARLnow. 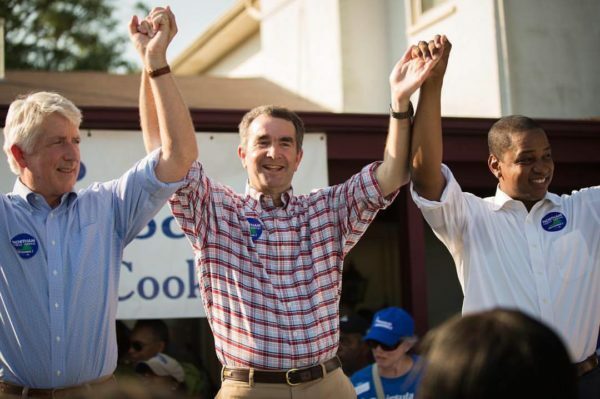 Democrats across Virginia have been shocked by yet another scandal today (Wednesday), after Attorney General Mark Herring admitted that he also once donned blackface at a college party. His admission comes as politicians of both parties continue to press Gov. 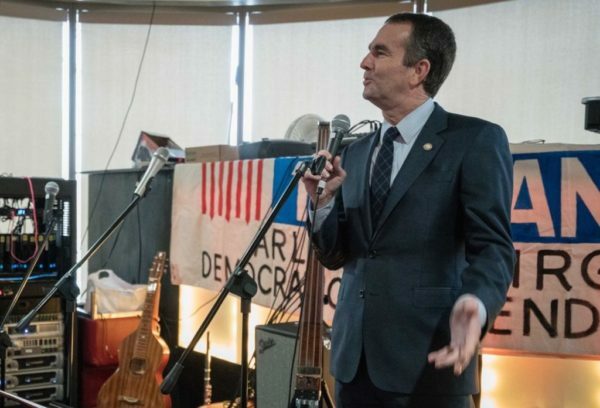 Ralph Northam to resign for similar reasons, after the discovery that a racist photo appeared on the governor’s medical school yearbook page and Northam’s subsequent admission that he once wore blackface rocked the state capitol. The man in line to replace Northam should he step down, Lt. Gov. 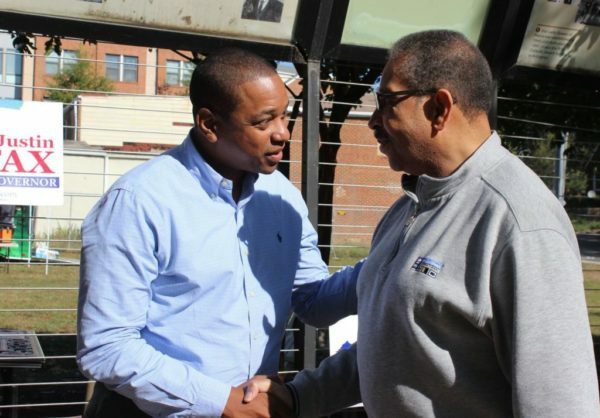 Justin Fairfax, has become mired in scandal as well since then, as a woman has come forward to accuse Fairfax of sexually assaulting her in 2004. The attorney general’s disclosure leaves the state’s top three elected officials in limbo — should all three resign, Republican House Speaker Kirk Cox would be in line to become governor. Herring said in his statement that he would have “honest conversations and discussions” about whether he’d seek to stay in office, as both Northam and Fairfax have so far sought to do. Herring joined virtually all of the state’s Democrats in calling on Northam to resign soon after the discovery of his yearbook page, but other Democrats have yet to demand that the state’s top lawyer step down with the same speed that they called for Northam’s job. Democratic Sens. Mark Warner and Tim Kaine expressed shock and surprise at the revelation when reporters questioned them about it this afternoon. SEN. WARNER reacts to the news coming out of Virginia, saying he’s “shocked and disappointed” by what he’s heard thus far about the Attorney General.
.@timkaine on Herring: "I am shocked and saddened to learn of this incident. This revelation throws salt in a wound opened wide in recent days." Other state lawmakers have yet to comment on Herring’s admission, including Arlington’s delegation or local Democratic committee. 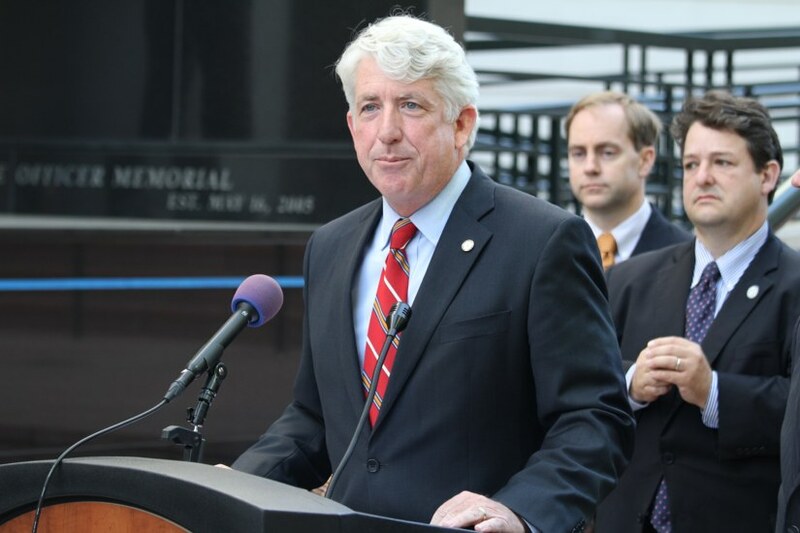 The news could also torpedo Herring’s nascent campaign for governor — he’d already announced plans to run for the top spot in Virginia politics in 2021, and earned the early endorsement of local Del. Patrick Hope (D-47th District) a few weeks ago. Hope did not immediately respond to a request for comment on Herring’s admission. The following Letter to the Editor was submitted by Michael Garcia, a Columbia Pike insurance agent who serves as the board chair of the Arlington Street People’s Assistance Network, a local nonprofit that works with homeless individuals in Arlington. 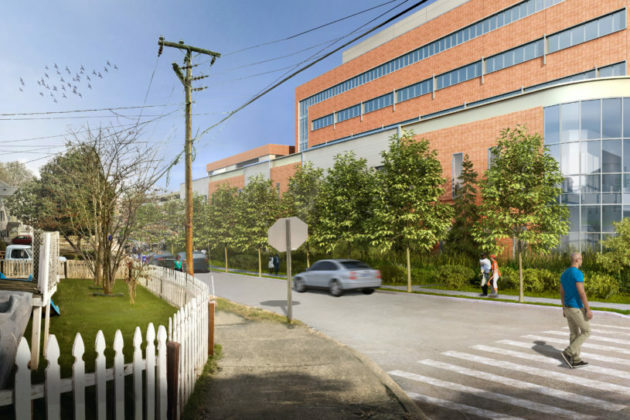 A-SPAN is weighing in on the proposed Virginia Hospital Center expansion, which the Arlington Planning Commission and some residents who live near the hospital oppose in its current form. 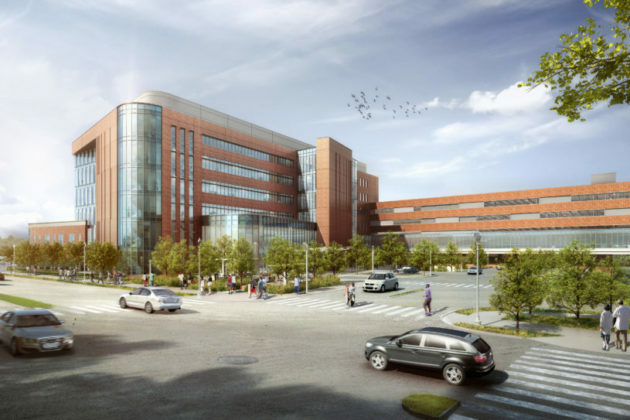 I am writing in support of the Virginia Hospital Center expansion project. 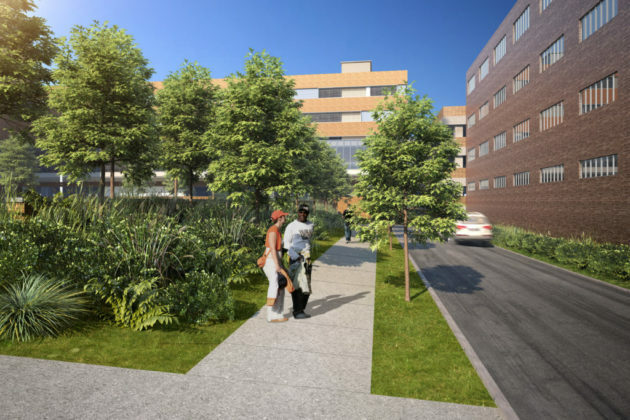 It is my hope that the County Board recognizes the enormous value that VHC brings to this community and approves the project, as soon as possible. As Board Chair of the Arlington Street People’s Assistance Network (A-SPAN) and a long-time Arlington resident, I see first-hand the consequences of delayed healthcare visits. The homeless clients at the Homeless Services Center frequently suffer from infections, life threatening reactions to untreated chronic illnesses and other medical conditions. That is why we have the Medical Respite and Nursing Services Program at the Homeless Services Center. For most Arlington County citizens, when a doctor says to go home and recuperate, that’s what they do, but what do you do when you have no home? VHC and A-SPAN through our partnership work together to ensure that these homeless individuals and veterans have a safe, compassionate, high-quality environment in which to recuperate. VHC staff make every effort to assess and treat patients in a holistic way. When homeless patients are discharged from the Hospital to the Medical Respite Program, A-SPAN is part of the follow-up care plan and clients are referred to VHC outpatient services, as appropriate. I cannot stress enough the value of a new Behavioral Health Center like the one proposed by VHC. Over 70% of homeless veterans and individuals suffer from some form of mental illness and this condition must be treated. We are fortunate that VHC, an Arlington provider that was recently named one of America’s 100 top Hospitals for the third year in a row, is willing to respond to the community’s need for more outpatient mental health services. Moreover, the VHC has indicated that all patients would be welcome at the new Center, regardless of their ability to pay. The distinction of VHC being named as one of the 100 Top Hospitals in the nation is an honor benefitting all Arlingtonians by providing excellent care to the community. I am confident that this commitment to excellence will extend to the newly proposed Behavioral Health Center services, as well. VHC is a community partner worthy of support and we hope our elected leaders demonstrate this support. The fairgoer tweeted an image painted on the “Monkey Maze” fun house that depicts a monkey with braids putting on lipstick. Arlington County Board Chair Katie Cristol agreed. Around 4:30 p.m. Thursday, the fair followed up with a pledge to take action. @DaveMRosenblatt, we appreciate you reaching out us. We are working with our ride vendor to ensure the image is no longer visible. 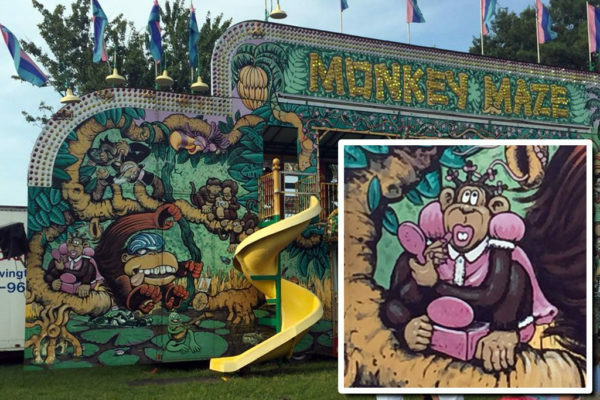 Monkey Maze fun houses are used by other traveling carnival companies, though photos posted online show different illustrations on the front of the trailer. A Google search did not turn up any other references to the Monkey Maze and accusations of racism. The fair runs through Sunday on the grounds of the Thomas Jefferson Community Center (125 S. Old Glebe Road). 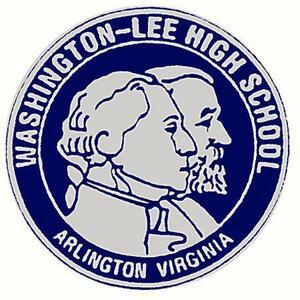 Morning Poll: Should Washington-Lee HS Be Renamed? The Washington-Lee High School renaming process continues to move forward, despite a lawsuit and opposition from many students and alumni. The School Board is hoping to have a new name ready for the school in time for the opening of the 2019-2020 school year next September, ARLnow has previously reported. But it will be an uphill battle for school officials, judging by emails we continue to receive from upset alums and other anecdotal reports; Sun Gazette Editor Scott McCaffrey wrote today that he and other staffers at the paper frequently run into W-L alumni, all of whom thus far have expressed opposition to the change. Since then, the emergence of an emboldened white nationalist movement and last summer’s deadly rally in Charlottesville have changed the conversation. But is it enough to change opinions on removing Lee’s name from W-L? Let’s find out. The issue of children being separated from parents seeking asylum at the U.S. border has prompted both words and actions from Arlington’s members of Congress. Rep. Don Beyer (D-Va.) yesterday signed on as a cosponsor of the Keep Families Together Act — Democratic-backed legislation that would end the family separation policy that has sparked nationwide and even international outrage. Beyer yesterday also visited two fathers who were separated from their children at the border and being held at a detention center in Maryland. TV cameras were there as Beyer and his wife Megan described a “very emotional, very difficult” discussion with the men. 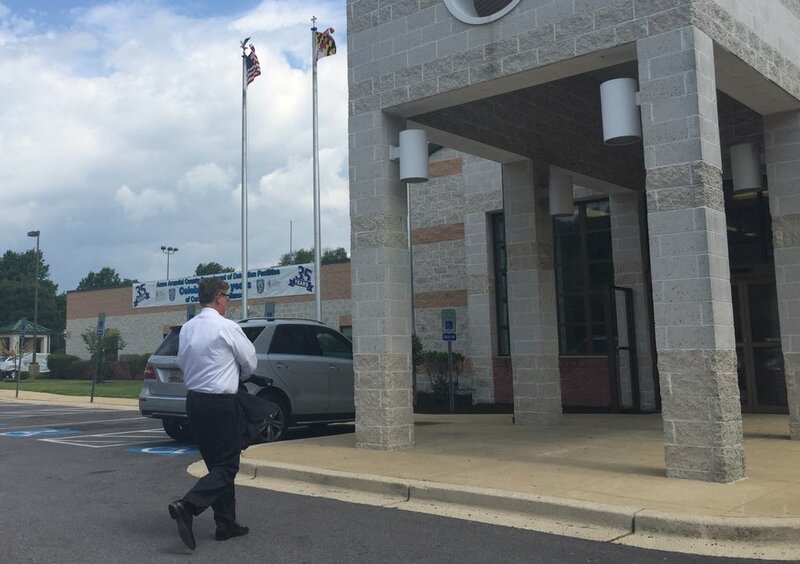 Today I visited an ICE detention facility outside Baltimore with @Call_Me_Dutch. There we spoke for an hour with two fathers, Carlos and Mario, who had been separated from their children, a 7-year-old boy and a 5-year-old girl, for months. Also yesterday, Virginia Gov. Ralph Northam (D) recalled four members of the Virginia National Guard from their service on the U.S. border. There’s more local fallout from the family separation issue. The Methodist church is considering expelling Attorney General Jeff Sessions as a member over his enforcement of the policy and justification of it by citing a Bible verse. News outlets reported that Sessions is a member of the Clarendon United Methodist Church in Arlington, in addition to a Methodist church in his home state of Alabama. Trista Nealon and some of her neighbors thought they were doing the right thing when they forced their way into the neighborhood pool to rescue some wayward ducklings — but now, their condo association is threatening them with criminal charges for their efforts. 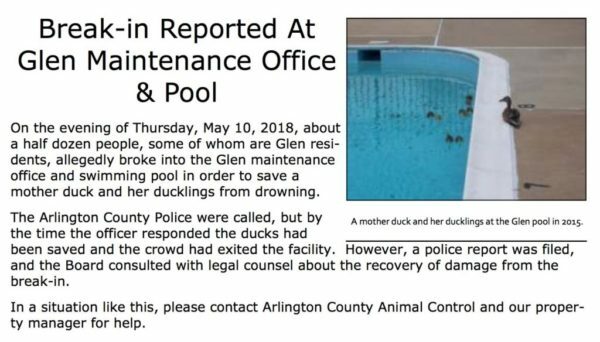 Nealon tells ARLnow that one of her fellow condo owners in Fairlington Glen noticed seven ducklings stuck in the neighborhood’s community pool back on May 10 and she decided to go ask the pool’s manager if she could get in and help them leave. When Nealon was rebuffed, she and her neighbors tried contacting a member of the Wildlife Rescue League to come help — again, they had no luck. So a group went back over to the pool, unlocked its gate by reaching in through a well-positioned mail slot, and fished out the baby ducks. “I am a [27-year] Glen resident owner, and it is ridiculous that I am being threatened with criminal charges for being a Good Samaritan and saving baby ducks,” Nealon wrote in an email. She shared a copy of the letter with ARLnow and also posted it to a Facebook group for Fairlington residents. Kristen Buck, an associate with the firm Rees Broome, said in the letter that the condo board felt a lock around the pool was damaged in the process of this rescue effort, and she’s requesting the people involved to pay the board $100 each to help reimburse the cost of replacing it. “Such a good faith payment may influence whether the Board decides to press charges or take other action,” Buck wrote. Nealon insists that no one damaged any property over the course of this episode, and she finds Buck’s suggestion that the neighbors should have simply called the county’s animal control to be without merit, given the “imminent danger” she felt the ducklings were in at the time. Buck declined comment on the matter, as did Thora Stanwood, president of the condo association’s Board of Directors. 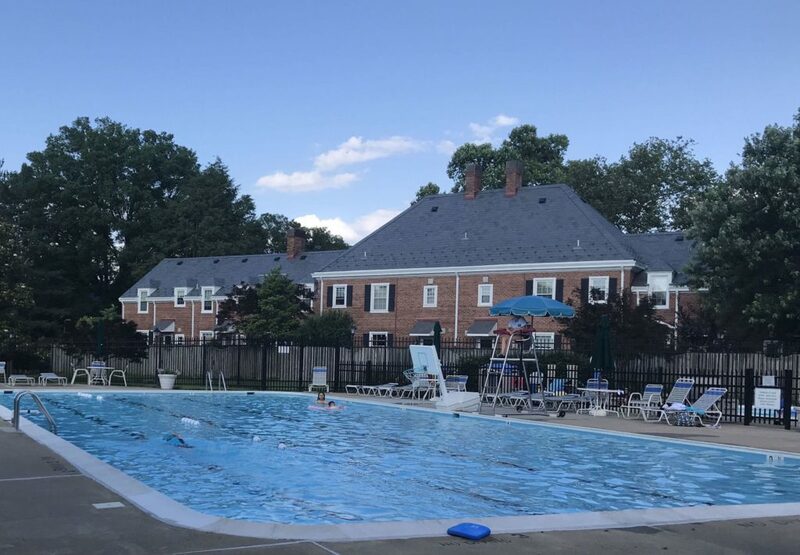 But, in a newsletter distributed by the condo association, there is a reference to a “break in” at the Fairlington Glen pool. The newsletter claims a police report was filed about the incident, and that condo association’s Board of Directors “consulted with legal counsel about the recovery of damage from the break in.” County police spokeswoman Ashley Savage says she has no record of any police report being filed from the area that day. Nealon isn’t sure what she’ll do next, but she at least plans to attend the condo association’s next meeting to protest her treatment, and she doesn’t expect she’ll be alone. Her post on the Fairlington Appreciation Society Facebook page about the incident already has 125 likes and dozens of supportive comments.